Home » My Country Gardens » Can You Tell Me What This Is? I’m hoping someone can tell me what this plant is. It isn’t anything that I have ever grown in any of my gardens, but it really doesn’t look like a weed. I would guess that it somehow came in with a plant that I did buy at some point… although I haven’t bought any plants in recent years, and we’ve never seen this one before now. The flower is fairly large… from petal to opposite petal each flower measures about two inches across, and each of the six long petals is about three-quarters of an inch long. I followed several of the flower stems all the way to the soil and there were no leaves… the stems and the flowers are all that is visible. Perhaps leaves appear at a later time? 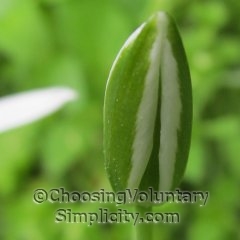 The flowers grow in clumps and are about ten inches tall from the base of the stem to the top of the flower. I have spent considerable time searching, trying to identify this plant with no results… except the one photo I found that was labeled “pretty little white flower.” :o) And I was hoping for something more specific! 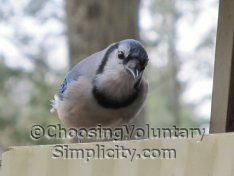 Can you help me? Do you know what this is? I can’t help you with identification but that indeed is a ‘pretty little white flower’. I think the center of the flower is especially beautiful. I hope someone will know what the name is. I actually have these so I am hoping you get the name of them too. Mine are blooming now and I just checked and they don’t have any leaves. Looks like Star-of-Bethlehem to me. I have never seen one, but it looks like it might be some type of lily. I hope someone can ID it! Oh I think it might be this! 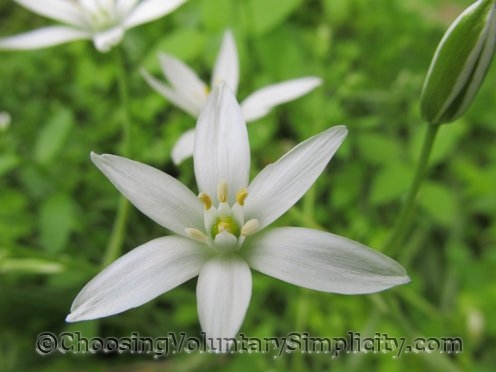 Star of Bethlehem. 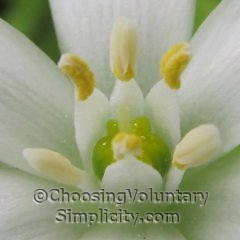 It looks like ornithogalum umbellatum, which is commonly known as Star of Bethlehem or “Milk-star”. Star of bethlehem flower just like the others said. We get them every year popping up.